Hello all, so sorry for my silence. It's been crazily hot here the past week, so I literally spent all day everyday in my mums pool. My plan to post a cheesecake recipe each day went out the window on day 2 haha! But the weather is oh so nice now. I've been crafting up a storm, working with paper alot at the moment. Some things I'm making for my shop, and others gifts. I hope to share them with you this week. For now, its cheesecake time, hooray! 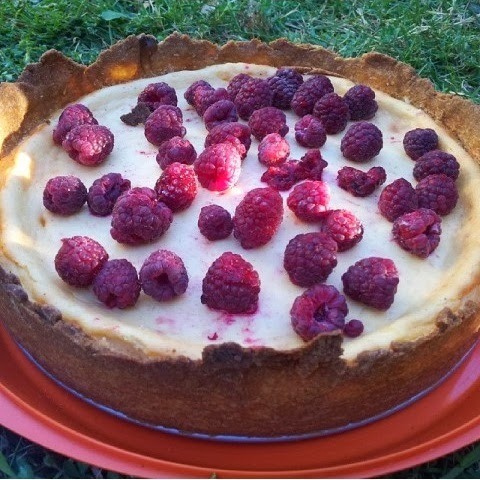 This is the second in my A series of delicious cheesecake recipes. My first was a gluten, dairy and fructose free cheesecake, and today is a traditional cheesecake but made with rice malt syrup. If you make this, let me know! First make the crust. In a food processor, combine the flour, salt cinnamon and butter until crumbly. Slowly add the rice malt syrup until the pastry forms a ball. Refrigerate about 20 minutes as this makes it easier to roll. You can roll it straight away if you want. When the pastry is ready, roll out and line a greased springform pan with it. Now make the filling. Beat the cream cheese until smooth. In another bowl, beat the eggs,vanilla and rice malt syrup until thick and creamy. Add this to the cream cheese with the lemon juice. Pour this mixture over the base. Stand the cheesecake on a flat baking tray and pop it into a prehreated 180C oven. Bake for 35 minutes. Turn oven off, leave door ajar, and leave the cheesecake to cool in the oven. When the tin is not to hot to touch, loosen the springform tin so the pastry doesnt cool and stick to the tin. Once the cheesecake has cooled in the oven, transfer to the fridge until ready to serve. Serve with fresh raspberries. Enjoy! Happy monday everyone, hope this new week is a positive, productive and peaceful one! Very fancy looking! :D Yum.